Ellen Alt's work is inspired by languages, alphabets and symbols. Starting with a calligraphy class in college, this interest has led from Cannonite pictograms, through the history of writing, to messages embedded in ice and floating in water as part of her recent work about climate change. 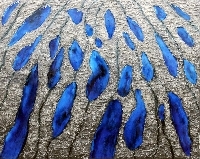 Her mixed media work has been exhibited in the U.S, Germany, Russia, China, England and the Middle East. One of her pieces was presented to Hillary Clinton on the occasion of the peace treaty between Israel and Jordan and is in the collection of the White House. Ms. Alt also organizes community sculpture and mural projects throughout the world. She holds an MA in studio art from New York University and a BFA from the Massachusetts College of Art and Design. Ms. Alt lives in Manhattan with her husband, Carlos Narvaez, a photographer; and maintains a studio in Long Island City. Polar ice is cold, colorful, stunning and weakening. I am riveted by the apparent contradiction: how can the unfolding beauty of melting ice be such a dire warning of planetary peril. I am proud to be among the growing movement of Climate Change artists and scientists. The Ice Melting series explores the changing forms of ice to foster awareness through the splendor of nature. The Ice Writing series is about what will be revealed as ice thaws. Messages appear in many linguistic symbols of human culture. These messages show us our history, how we got to where we are and directions of how to proceed to talk to each other regardless of linguistic. political and physical barriers. My White series is about the shifting balance between water and ice. All work is mixed media. Materials include ink, acrylic, oil paint, spray paint, epoxy resin, wax, glass, sand, plastic, glitter, salt, sugar, rocks, clay and found objects. Supports include paper, wood, panels and metal. Sizes range from 11" x 14" - 36" x 72".